Childhood is a period when the immune system is still being developed. This vulnerability explains the large number of diseases that affect children. Despite treatment efforts against the diseases that attack, there is a high mortality rate among children, often because of limited access to health care. Each year, approximately 12 million children die before the age of five. Many of them are not even a year old. Seventy percent of these deaths are due to one of the following diseases: diarrhea, pneumonia, malaria, or malnutrition. Poor nutrition is responsible for a large part of mortality among children. 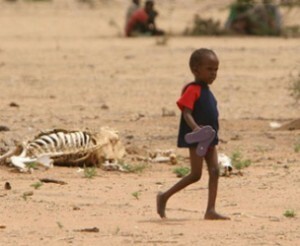 Between 30% and 50% of deaths of children under 5 are linked to malnutrition. Moreover, a quarter of these deaths occur in the first few months of life as some weigh less than 2.5 kg at birth. (16% of infants in the developing world). UNICEF estimates that 150 million children suffer from nutritional deficiencies that have irreversible repercussions on their health. Pneumonia remains one of the deadliest diseases for children under five. According to estimations by UNICEF and WHO, nearly one-fifth, or approximately 2 million deaths of children under five, are caused by pneumonia. Diarrhea remains a major cause of death for children under five years old. WHO estimates that a child has 5 episodes per year and that 800,000 children die per year due to diarrhea or the dehydration that causes it. These deaths are often associated with severe under nutrition and measles. Not only does dysentery directly cause child mortality, but also causes frequent and persistent diarrhea that accounts for 15% of deaths among children. Malaria is also one of the major causes of death among young children. For those under five years old, around one million children die each year from this disease. 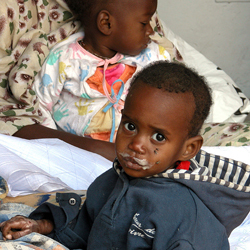 African children pay the heaviest toll in terms of the number of deaths caused by malaria. This is especially true in rural areas where there is limited access to healthcare. Certain UNICEF surveys showed that 30% of children under five have had consultations in a health center because they presented symptoms of pneumonia and malaria, and they required treatment for both. With few exceptions, the infant mortality rate is much higher in developing countries than in developed countries. This is due to poor health conditions among children, including the lack of health coverage and the high cost of care. Sick children are often faced with a lack of health coverage. The estimates from the most recent surveys have shown that a global overall lack of health coverage for sick children, in 54 countries, was 43%. The individual values by country for some countries were estimated at over 70%. That being said there are significant differences in health coverage for sick children in poor countries and in rich countries. In fact, the lack of coverage for the treatment of sick children in poor countries and rich countries differs by 33.9 %. The fees paid directly for the treatment of sick children, are often high for poor families. In addition to these direct costs, the patient must bear the costs (medicine, laboratory tests, radiology tests, transport to the hospital, food, shelter) that are not provided by public hospitals.